Play Unplugged – Covington is a great way to get the local kiddos “unplugged” from electronics and encourage being active out in the community! How does it work? Business that sign up to participate in the program. City, Chamber and Business representatives visit the local elementary schools and provide the children with lanyards (courtesy of MultiCare Health System) with instructions on how to sign up for FREE. 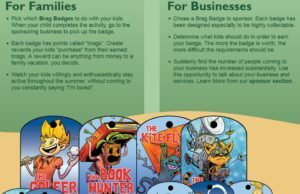 Guardians sign up the child online and begin visiting all the participating businesses to collect their “Brad Badges” and turn them in at the end of a 3 month Swim Pass at the Covington Aquatic Center all for FREE!